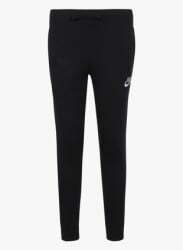 Add an extra dose of energy to your little girl’s active personality with this pair of black track pants from Nike. Designed with an elasticated waistband and brand name on the left thigh, these pants will instantly become your girl’s favourite. Made of 100% cotton, these pants provide optimal wearing comfort and a soft feel to the skin. Let her wear these track pants with a comfortable T-shirt and shoes.